David Shostac, well-known for his performances throughout North America, is also principal flutist and frequent soloist with the Los Angeles Chamber Orchestra. David has been principal flutist of the St. Louis, Milwaukee, and New Orleans Symphony Orchestras, as well as the Mostly Mozart, Ojai, Carmel Bach Festival and Aspen Chamber Orchestras. In addition to his long tenure with the Los Angeles Chamber Orchestra, he performed as principal flutist with the Aspen Festival Orchestra for fifteen years. Recent solo appearances with the Los Angeles Chamber Orchestra include the premiere of his “Carmen Fantasy for Flute and Orchestra” in 2009. Critics have been unanimous in their praise– terms such as ‘extraordinary’; ‘superb’; ‘sheer excellence’; ‘dazzling’; ‘staggering virtuosity’; ‘absolutely fabulous’; ‘finest in the country’; ‘world-class’; ‘a musician of the highest order’ have been used to describe his performances. Solo appearances have included the Hollywood Bowl, Lincoln Center’s Mostly Mozart Festival, the Casals Festival of Puerto Rico, the Aspen Music Festival, Ojai Festival, Stratford (Ontario) Festival, Carmel Bach Festival, and six National Flute Conventions. He has collaborated as a featured artist with conductors Sir Neville Marriner, Jean-Pierre Rampal, Iona Brown, Christopher Hogwood, Cristof Perick, Gerard Schwarz, Claudio Scimone, Karl Richter, Helmut Rilling, Jorge Mester, Henryk Szeryng, Jeffery Kahane, and many others. David is a former member of the American Symphony Orchestra with Leopold Stokowski, and has performed with the Boston Symphony (Seiji Ozowa, Erich Leinsdorf, and Eugene Ormandy) and Los Angeles Philharmonic (Zubin Mehta). He has appeared in recital with Jean Pierre Rampal, Roberta Peters and Victoria de Los Angeles, and can also be heard on sound tracks of hundreds of major motion pictures. His solo recording, Chamber Music Classics for Flute, features the 2002 Grammy®-winning Angeles String Quartet and Pacific Trio. His discography also includes JS Bach: The Six Flute Sonatas, Masterpieces from the French Repertoire, The Romantic Flute (volumes one and two), Bach’s Brandenburg Concertos, and a historic recording of Terry Riley’s In C. The 2003 release by the Bel Arts Trio, of which David is a member, features the music of Gershwin, Bizet, Fauré, Rimsky-Korsakov and others. Formerly a professor at the University of Southern California and a member of the faculties of UCLA, UC Irvine, the Aspen Music School and California Institute of the Arts, he is currently on the faculties of California State University at Northridge. 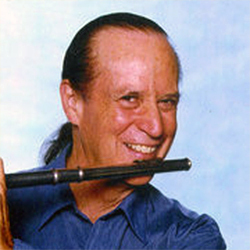 His book, Super Warmups for the Flute (1992) is popular with students, teachers, and professionals.